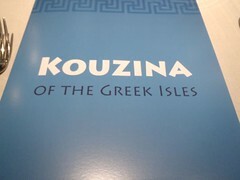 The Greek Menu is a themed menu served in all three restaurants on the same night. 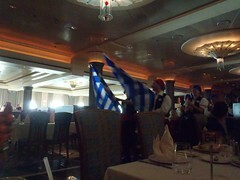 Near the end of the meal the servers came out carrying Greek flags and danced around the dining room. Appetizer – Mik ordered the Kalamarakia Tiganita (i.e. 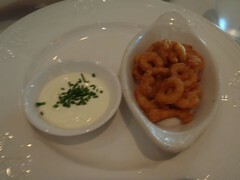 fried calamari/squid). He enjoyed his so much that he also finished half of Mom’s and another order of it. Soup – Mik thought the Parosoupa was okay. 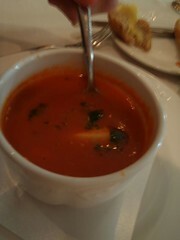 It is Fisherman’s soup with red snapper, mussels, and vegetables. 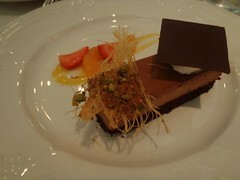 Entrée – Mik had the Rosemary Marinated Lamb Sirloin since he had enjoyed the lamb so much at a previous dinner. 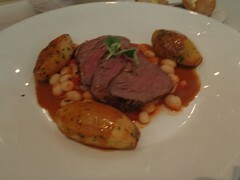 It did not disappoint, although he was disappointed in the oregano roasted potatoes being rather light on the oregano. 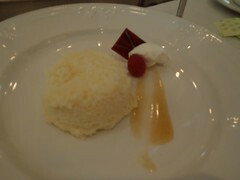 Dessert – Mik tried the Greek Lemon Cake and the Serano Chocolate Cake. His first choice would have been the lemon cake, but he actually only like the chocolate cake, so it was glad he had ordered both from the start.